Sunnies, Black Shirt and Boots: Target. You guys, I might have a problem! 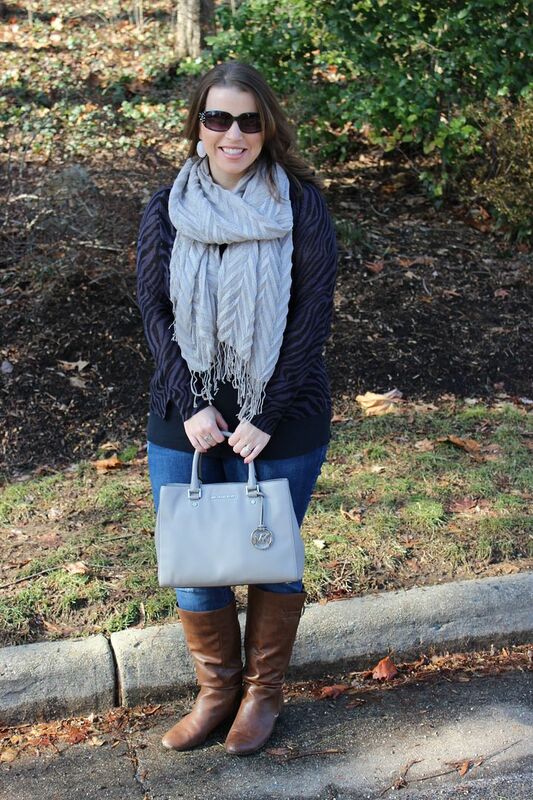 I absolutely love adding scarves to my outfits and have realized that I have a lot. And I mean A LOT. 30 to be exact. And I wear every single one of them!!! Scarves are multi purpose in the winter months; they keep me warm and snuggly and add some extra flair to my wardrobe. Just by adding a scarf, I can stretch my wardrobe to get some new looks. 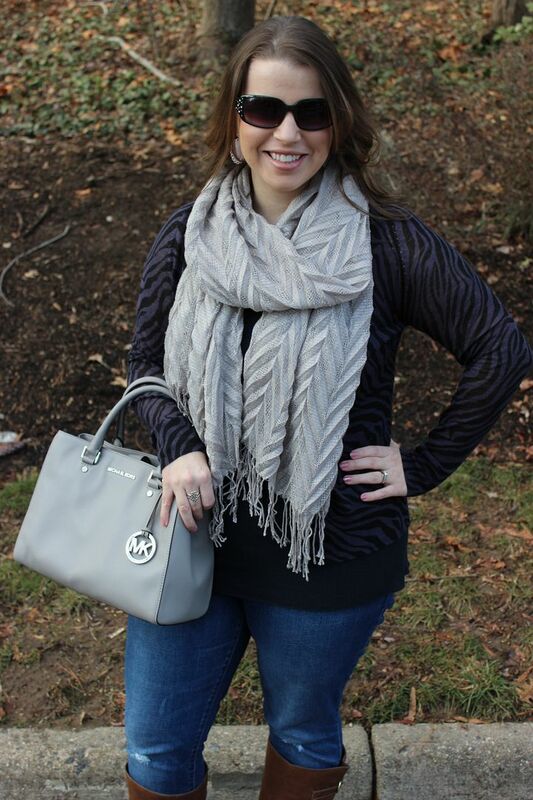 This silver scarf is one of my favorites. I love it because it is so long so I can wear it multiple ways (furthering my outfit options - this scarf thing is genius!). Plus, since its silver and basically a neutral it goes with almost anything in my closet. Not to mention there is a little bit of sparkle in the scarf so I feel kinda glam when I wear it. 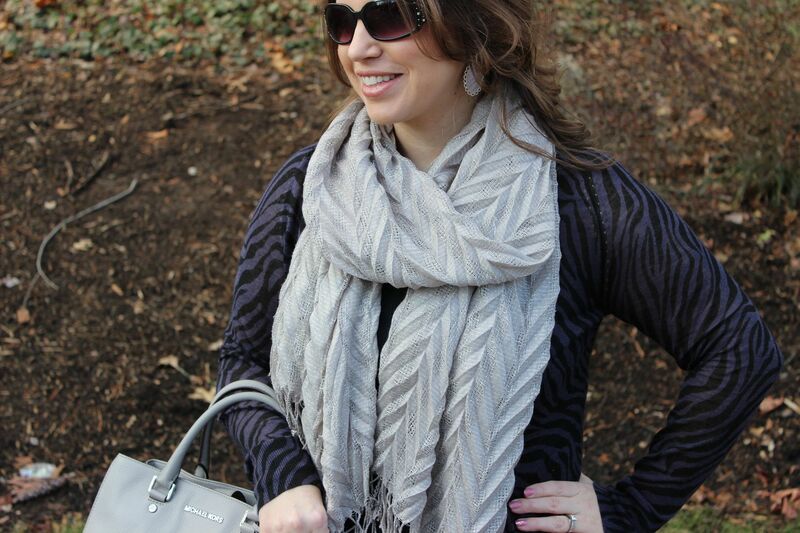 Who am I kidding, I feel glam in any scarf! 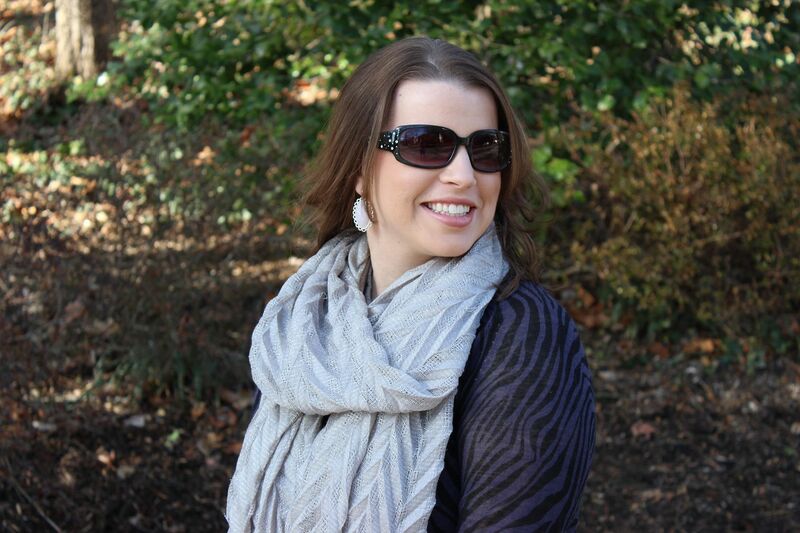 Seriously, I have three items that are my go to items if I ever need to feel glam and extra pretty: scarves, a pair of heels and sun glasses. You cannot go wrong with those three things; they will transform you and any outfit! Give it a try. Linking up with Walking in Memphis in High Heels for Trend Spin, The Pleated Poppy for What I Wore Wednesday and Style Elixir for Style Sessions. scarf are so much fun to wear. I only have 10 or so. I was on a scarf kick last week. Wait, you have 30 scarves? I don't have 30 socks. I was never really into scarves until last year. Since then, I'm not even sure how many I've amassed. They definitely add a cozy factor to any outfit! I'm really loving this subtle pattern to yours! our styles are very similar...apparently I was following you via GFC but not bloglovin - Now I'm following on both :) I headed over here from the big giveaway over at Chelsea's blog...thanks for that by the way, I'm seriously hoping I win, but hey...who isn't! haha. come say hi if you get a chance, I love making new blogging buddies! I love scarves too! They really are the perfect accessory. I recently bought a scarf holder from IKEA and was surprised to see how full it is!! Found you on the Style Sessions link up.